More info:Optional single supplement £470. Mimimum age 12. If you enjoy the freedom of walking independently but would love a bit of local knowledge and someone else to carry your luggage then this 12 day self guided Tour du Mont Blanc itinerary is for you. 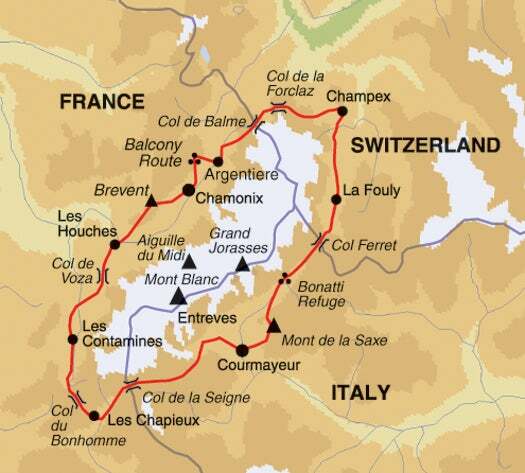 Experiencing the mountainous terrain of Italy, France and Switzerland as part of the same tour is such a thrill, with warm and welcoming hotel and auberge accommodation ensuring a good night’s rest in between days spent walking significant distances. This is a classic point to point walking circuit that really lives up to the hype. Complete route details help to create an incredibly immersive experience with the added advantage of fully-marked trails and luggage transfers ensuring this tough, yet rewarding, tour is achievable for weekend walkers. Due to the nature of the weather conditions around Mont Blanc this tour can only be undertaken in the summer from the middle of June to the start of September. Talk about a window of opportunity! Few holidays have as little detrimental impact on the environment and local residents as a walking and trekking trip. Erosion on and adjacent to popular paths is a growing problem in certain places and therefore our trip leaders encourage clients to stick to advised routes in order to minimise this. We believe in leaving no more than footprints and have a strict policy with proper disposal of litter. We understand that this sense of responsibility is even more necessary in the case of Mont Blanc than some other trekking sites as the mountain does not have National Park status and regulations to protect it. Our staff are trained with environmental stewardship in mind and protective guidelines are then passed on to our clients on their initial briefing in order to keep our impact neutral. For accommodation and eating out we use smaller business that benefit the local community by keeping investment in the area. We spend most nights in locally owned, boutique hotels, pensions and village inns, except for 3 nights in local auberges and 1 night in a mountain refuge; and meals are usually communally organised which is more efficient and less impactful. Where meals are provided, local supplies are used if possible and for independent meals there are plenty of local shops and cafes en route as well as a Saturday market in Chamonix. On the route you can stop almost daily in locally run refuges and have a coffee and a big slice of cake. It does not sound like much but these are all locally owned establishments and your business is an excellent source of income for them. Water is a really important issue with trekking trips - especially as this trip reaches an altitude of over 2,500m at Brevent, which might be quite challenging. To stay hydrated it is vital that we have a system for providing clean water without causing lots of waste with plastic bottles. We suggest that instead of repeatedly buying bottled water, you should use fresh water springs on the way to re-fill a singular container. These springs are clean and are a wonderful resource for reducing plastic waste, or guests can simply re-fill at the hotels and guesthouses where they stay.